First ride out in a while due to the snow and frost. Met up with some of the Yorkshire lot just outside Holmfirth and followed them via Glossop and Rainow to the Cat N Fiddle. I had to be back for 1:00pm so left them there and proceed home via Macclesfield and Poynton and the A34 Handforth Bypass and then the M60 back to home. 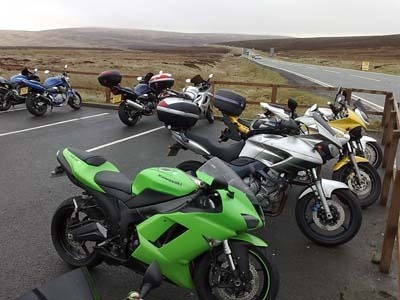 Roads were damp but not too greasy, it was a bit windy and we had a bit of fog but other than that nice biking weather. Didn't see to many other bikes out and about. My new winter polar fleece lined thermal under base layers worked great under my leathers and kept me really nice and warm. Big thumbs up for them.